I continue in my quest to convince everyone that orchids are “easy” houseplants and really require no more maintenance than any other houseplant. In fact, I think they actually prefer less fussing around! 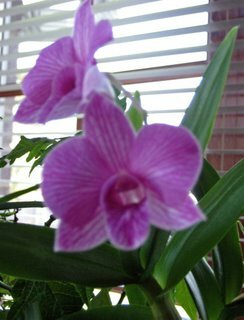 Here is an orchid blooming now in my sunroom. I bought this several years ago and it is now blooming annually at about this time. I don’t know the variety but believe this is a Dendrobium sp. orchid. (Comment if you believe otherwise). 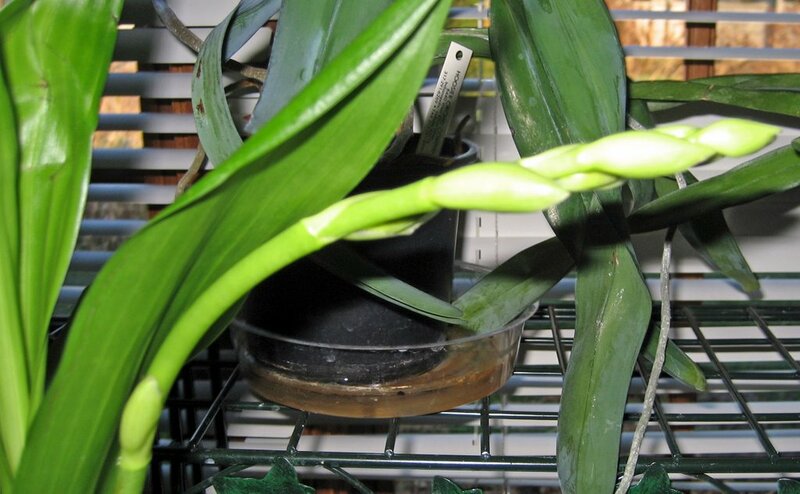 And look at this orchid in bud. This is a Zygopetalum sp. When it blooms, it will fill my sunroom with a heavy tropical flower scent. I can’t wait! I promise that I do nothing special to these orchids. Water, light, some light fertilizer. Really that's all. In fact, I water them less frequently than I do other houseplants. And bonus points for you if you noticed that the sun is shining through the windows in these pictures taken yesterday. The sun has been shining all week and we are promised it will continue to be sunny for several more days. A rare treat for November in the midwest. And it is perfect weather for continuing garden clean up or putting up outdoor holiday decorations. We are blessed, indeed! I never have luck in getting an orchid to bloom..I cannot figure it out. Love them when I purchase them but realize as soon as the flower fades so will the plant. The leaves get all wrinkly? ?Am I overwatering? Humm...they are expensive to replace! Carol, I'm really impressed you can keep these blooming. I've heard it's not hard, but they never bloom again for me after the first spike fades. I think it may be something to do with light. It looks like you have a really sunny room to keep them happy! I believe the Dendrobium is a bushier plant, with leaves not unlike a daylily. I believe what you have there may be a Catalayea (sp? ).